Cape Verde: Timor-Leste signed a mutual visa-waiver agreement with Cape Verde on 21 July 2014 and entered into force on 14 April 2015. This agreement allows citizens of the respective countries to stay up to 30 days without a visa. European Union: Timor-Leste signed a mutual visa-waiver agreement with the European Union on 28 May 2015 which was applied on a provisional basis as from the date of signature and ratified on 15 December 2015. This agreement allows all citizens of states that are contracting parties to the Schengen Agreement to stay without a visa for a maximum period of 90 days in any 180-day period. All visitors who need a visa (except for citizens of Indonesia who can apply on arrival at any border post) arriving at a land border post must apply in advance for a Visa Application Authorization which is then presented to an immigration official at the border. If other conditions are met a single or multiple entry visa valid for up to 90 days is granted for a fee of US$30. Visitors which are exempt from a visa (such as citizens from a Schengen country) do not need a visa (and hence no Visa Application Authorization) at any land border crossing. Visitors may apply for visa on arrival at the Presidente Nicolau Lobato International Airport or at the Dili Sea Port. If other conditions are met a single entry visa valid for up to 30 days is granted for a fee of US$30. Transit visas are available for stays less than 3 days for a fee of US$20. There is no transit without a visa option in East Timor. Visa application may also be submitted online or at one of the East Timor diplomatic missions prior to arrival. Accommodation arrangements and a return or onward ticket. US$150 per day expected to remain in the country (for tourist or business visas). US$100 plus US$50 per day (for transit visas). All nationals with a visa may extend their stay to a total cumulative stay of 90 days by submitting their application to the Immigration Department. The fees are US$35 for a 30-day extension, or US$75 for an extension between 30 and 60 days. Wikivoyage has a travel guide for East Timor. ^ "Tourist & Business Visa". Immigration Service of Timor-Leste. Retrieved 28 September 2013. 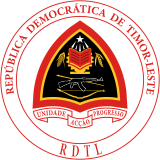 ^ "Timor-Leste signs Agreements with Cape Verde and Sao Tome and Principe « Government of Timor-Leste". timor-leste.gov.tl. ^ "Cabo Verde approves waiver agreement for ordinary visas with Timor-Leste". 14 April 2015. ^ "Data" (PDF). www.statistics.gov.tl. 2014. This page was last edited on 2 February 2019, at 21:33 (UTC).